Maybe home prices are finally where they should be. A new study from Quicken Loans revealed that the gap between appraisers’ opinions of home values and those of homeowners narrowed significantly in January. In fact, appraisers only valued homes 0.18% higher than homeowners, which makes you wonder if homeowners should be appraisers. Just kidding. 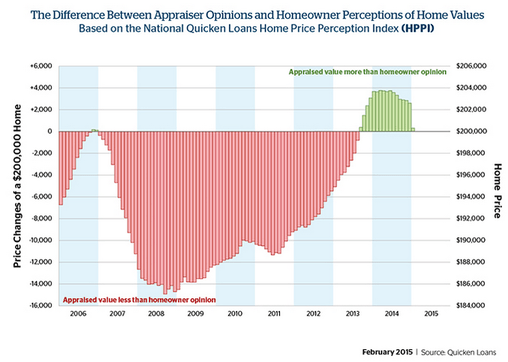 The opinions between appraiser and homeowner haven’t been closer since September 2013, and aside from that month, haven’t really been much closer ever. Their opinions were apparently exactly even in October 2006…but then home prices ran higher and higher and eventually became unsustainable, leading to quite a gap. In December 2014, the gap was 1.43%, and it seems to be trending lower and lower. Let’s just hope it doesn’t go negative again, especially with refinance applications on the up and up. The low took place in September 2008, when appraised values were on average $14,873 lower than what homeowners felt their homes were worth. Does this mean we’ve finally found equilibrium in the housing market where home prices aren’t over or undervalued? Well, it appears as if we’re getting to a point where most seem to agree on home values, but that can change quickly. During the housing bubble, appraised values were coming in a lot lower than what homeowners felt their properties were worth. That meant many people couldn’t refinance without special programs like HARP, which are much more flexible when it comes to LTV limits. Nowadays, homeowners might be a little too modest; though they’re probably just shocked their homes have increased in value so rapidly after many painful years. From December to January the appraiser/homeowner gap narrowed in 66% of the metros covered by Quicken, but appraisers still have higher opinions of value in 74% of metro areas nationwide. Let’s take a look at where the two groups are still a ways off from one another. In San Jose, appraisers valued homes 6.42% higher than what homeowners felt they were worth, as indicated by the estimate the homeowner provides during the mortgage application. This means San Jose residents might be able to get a larger loan than they realize, or take more cash out while refinancing. It’s generally a good thing because it means home value shouldn’t get in the way of things, though the borrower must still qualify. The same is true in San Francisco, where appraisers valued homes 4.59% above homeowner opinions. Other winners included Dallas (+4.10%), Denver (+3.97%), and Portland (+3.54%). On the opposite end of the spectrum were metros like Kansas City (-3.73%), Charlotte (-1.62%), Philadelphia (-1.59%), Cleveland (-0.97%), and NYC (-0.83%). 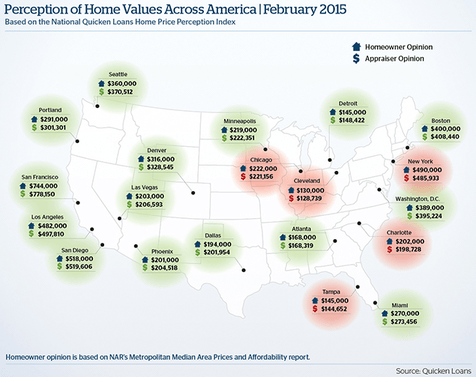 In these metros, homeowners seem to think there homes are worth a bit more than the appraisers, which could lead to some unpleasant issues and possibly declined loan applications. These numbers may also indicate where home prices are on the rise, and where property values are beginning to sputter. Overall, the narrowing gap implies that recent home price gains are now widely recognized by all parties, which could lead to more refinance applications and possibly more home listings as some homeowners acknowledge a potential exit point after years of being underwater.